Many thanks to M Intergrated Solutions for forwarding some visuals to us of a recent project WE assisted with. 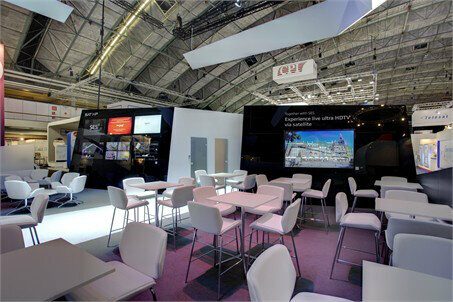 M approached Working Environments in March 2012 to help source and supply a suite of products for a large scale exhibition stand they were designing for SES Global Marketing. Having worked through a number of options based on various design and budget criteria samples were sent to Berlin for approval by the client. The winning product was the Kruze range of tables and chairs from Boss Design. With a limited lead time before the first exhibition in Singapore we were able to turn around the order and ship to the client in Germany on time and budget. Overall this was a very successful collaborative project from our point of view and we were exceptionally pleased to hear that the stand itself was winner of the best in class ‘Large bespoke build’ at the Amsterdam exhibition in September of this year.